Fantastic production, superb sound and very well crafted songs. Roger Glover has had a sporadic solo career during his time as a celebrated bassist for Rainbow and Deep Purple, two of rock's greatest and most influential bands. Now, following the example set by Ian Gillan's 'One Eye To Morocco' and Don Airey's 'All Out', Glover gives us a brand new solo record himself. Roger sums the album up best in his liner notes where he states 'this hodgepodge collection of songs reveals or obscures a range of emotions over a turbulent decade; separation, divorce, injustice, uncertainty, new love, fatherhood, grand-fatherhood, emigration, touring and losing my mother are some of the extreme highs and lows during this storm tossed period'. With that in mind, it's hard to pigeonhole this album. Roger isn't kidding when he says it's a hodgepodge collection - there are a variety of styles on this album, along with a variety of singers, recorded at a variety of locations on a Mac with Pro-Tools. 'Don't Look Now (Everything Has Changed)' opens the record, with lead vocals handled by Randall Bramblett. It has an almost reggae feel to it and it, in all fairness, is a quality track which Bramblett is perfect for. 'The Dream I Had' is more old school rock and roll, with lead vocals by Nazareth's inimitable screecher Dan McCafferty. This is then followed up by 'Moonlight', an easy listening number sung perfectly by Roger's daughter Gillian. I think by now you realise that this is nothing like Deep Purple and you have no idea what might come next. Roger handles the lead vocal for the amusing 'The Car Won't Start' which has an almost Ska/Madness vibe, before exploring a darker side to his delivery on the distorted riff driven 'Box Of Tricks'. 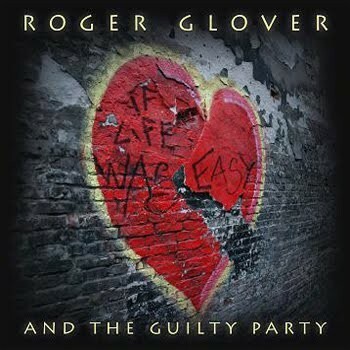 While Roger is only too quick to point out his shortcomings as a vocalist, he actually handles the ones he fronts very well - none better than the gentle acoustic based title track. Tracks like 'Welcome To The Moon' allows Roger to explore his true solo side as he wrote the song, sings it and performs all the instruments on it. He also rocks out a little on the final track 'Feel Like A King'. All in all, I think the guests will make or break this album. Depending on your preference, some might find a wide variety of vocalists off putting, others might like the variation. Randall Bramblett and Gillian Glover steal the show for me, they both seem to be the most in tune with what Roger was doing. Mickey Lee Soule even pops up for vocals on 'The Ghost Of Your Smile' - but frankly I prefer him on keyboards. I can't dislike the work on this record, but I find it's best sampled as odd tracks here and there, rather than as a whole, because it is a 'collection', it's not a cohesive album. The production however, is fantastic, the sound is superb and the songs are very well crafted. It's not what I would define as a solo album, it sounds more like a songwriters anthology - but then I guess Roger would prefer that, as he openly tells me in this very issue, he identifies much more with songwriters than he does singers. If you're a fan of what Roger has done before outside of Purple and you have varied taste, there's plenty here to absorb you. But if you're looking for some hard rock, you'll find very little here - this is Roger exercising his right to explore outside the confines of his parent band. While it is very good, I think sixteen songs and so many styles make it hard to get through in one listen. Sampled as a random track here and there though - it makes you realise how talented a songwriter Roger Glover is!